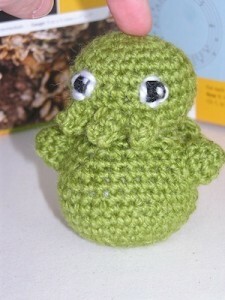 Creepy Cute Cthulhu – “M actually follows a pattern” or at least she tries to. 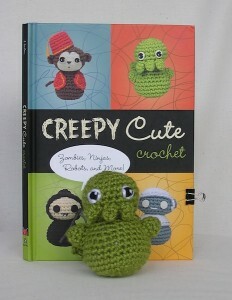 I’ve had a copy of Creepy Cute Crochet by Christen Haden for quite some time now, but only recently attempted to make a creature from the patterns included in the book.Â My boyfriend requested a Cthulhu and I decided to give it a whirl the other day when I needed to create something to get my creative self back on track. I have made several amigurumi critters in the past, but none this small, and none from a pattern. I usually just make them up as I go. I tend to look at the yarn options in front of me and let it tell me what it wants to be. Sounds so cliche, I know, but it has worked out so far. Being familiar with the Magic Ring technique for starting and with all the stitch abbreviations made following the instructions much easier for me. I have never been able to read the diagrams before, but gave it the good ole college try with this pattern and was surprised to find how simple it was to decipher when I actually paid attention and didn’t panic and revert to the text directions. The body instructions were simple to follow and very straightforward. 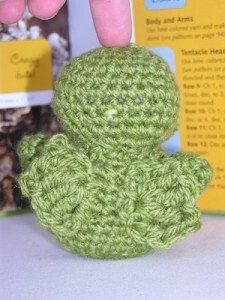 I found the head directions less so and always ended up with too many stitches in my round at the end of each row. I didn’t want to spend two whole days making a 4 inch tall doll so I ditched the bulk of the head directions and just made sure to have the right number of stitches and to leave spots to add the tentacles. The arms and tentacles worked out well by (mostly) following the directions. The wings, however, did not turn out right and never came out looking similar enough to each other. It might be that I tend to crochet looser than the designer and they got a bit amorphous, but I again had to ditch the directions and make them up using the triple crochet stitch recommended, but in my own sort of shell stitch pattern. I stitched all his pieces/parts together using waste yarn and opted to “embroider” his eyes on with yarn instead of using felt as directed. I have “a thing” against using glue on fiber projects if there is a stitching option that will work instead. (But that is a personal preference, not a judgment against the use of felt.) I stitched on black yarn eyes, surrounded them with white yarn stitches and then put a little eye glint on the black eye with a single white stitch. I recommend picking up a copy of this book if you are just starting out in amigurumi and like creepy yet cute monsters because the basic shape is the same for many of the monsters and you just add the extra bits to make them unique. It is also a great source of inspiration and refresher methods for the more advanced stitcher. I took some photos to prove his existence (and share here) and then placed him atop my boyfriend’s computer where he would be easily spotted when he came home from work. 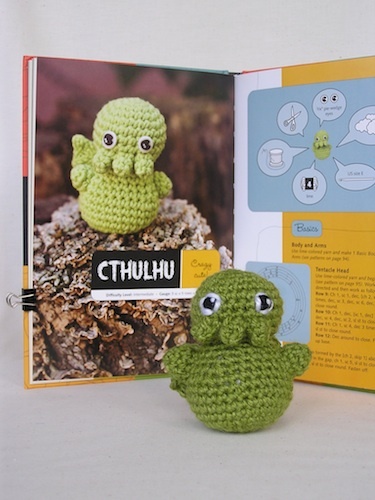 Cthulhu was well received and spent a bit of time being floated around my living room, growling his supremacy, and threatening to devour my world. He is a bit too cute to instill too much fear in my heart, but he definitely seems to have secured me a place in my boyfriend’s.